"Do you not hear this horrible scream all around you that people usually call silence?" Werner Herzog is the most fascinating, uncompromising and inspiring motion picture director of our time. Among his fifty-plus credits are such unforgettable films as AGUIRRE: THE WRATH OF GOD (1972), FITZCARRALDO (1982), WHERE THE GREEN ANTS DREAM (1984), MY BEST FIEND (1999) and RESCUE DAWN (2006). He is the only feature film director to have made a film on every continent, and over the years he has racked up nearly five dozen major awards and nominations for his work worldwide. Among these accolades are the Grand Jury Award and the Prize of the Ecumenical Jury presented at the 1974 Cannes Film Festival for his profound, frighteningly insightful THE ENIGMA OF KASPAR HAUSER -- truly one of Herzog's most memorable and intriguing features. 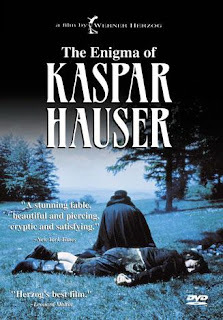 Based on a true story, Kaspar Hauser was a mysterious historical figure who, one morning in 1823, appeared standing frightened and motionless in a town square clutching a Bible and an anonymous letter. This young man, probably in his late teens or early twenties, was barely able to walk and was totally uneducated -- the result of being chained to the floor of an isolated stone tower his entire life. There was no human contact of any kind; he was slipped a tray of food at night while asleep so he could not see or interact with those responsible for his incarceration. Furthermore, the only light reaching his solitary cell came from a small opening too high for him to look out. As a result, this young man had never previously seen a tree or a bird or another living organism other than perhaps an occasional spider and, possibly, rats. 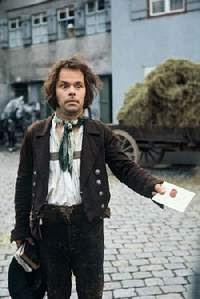 Barely able to walk, and totally uneducated, Kaspar Hauser is soon extensively examined, exploited, mocked and ultimately killed by a member of a society in which he found himself forceably immersed. Herzog brilliantly presents a parade of so-called experts who attempt to assess and classify this unfortunate, nescient stranger into some type of scientific pigeonhole which would conform to their preconceived understanding of human nature and the manner in which knowledge is acquired and then processed. This array of notable scientists and philosophers recognized that Kaspar Hauser represented a unique specimen of a man living in a pure, natural, uncivilized state. Their collective failure, however, to even begin to understand this "enigma" leads to the notion that, possibly, none of mankind's accumulated knowledge may really have any meaning at all. There is no other director alive who would even attempt to explore this premise -- none. In portraying the enormous grind endured by an outcast struggling to make his way into the "established" world, Herzog found a perfect metaphor for his own personal struggles within the film business. "You have to be daring to do things like this, because the world is not easily accepting of filmmaking. There will always be some sort of an obstacle, and the worst of all obstacles is the spirit of bureaucracy. You have to find your way to battle bureaucracy. You have to outsmart it, to outgut it, to outnumber it, to outfilm them -- that's what you have to do." Bruno S. is fantastic in the title role. For a period of twenty-three years this troubled man found himself institutionalized in one mental institution after another, frequently escaping only to be caught and incarcerated again. When Herzog met Bruno he was dividing his time as a street performer and a forklift operator. Only Herzog would be so bold as to cast someone like this for the title character in a motion picture -- but, once again, Herzog's films have never depended on "acting" in the conventional sense. Rather, he focuses on individuals who embody the essence of the character and can portray that essence with raw, unbridled intensity. "There are certain laws and elements that make a film more accessible to mainstream audiences. If you've got Tom Cruise playing a strongman, I'm sure it would have larger audiences, but it wouldn't have the same substance." The original title for this motion picture was EVERY MAN FOR HIMSELF AND GOD AGAINST ALL. That, of course, was too esoteric for American audiences. But thanks to the unwavering determination of Werner Herzog, the title was the only thing changed when the film crossed the Atlantic. And think about this -- had this story been adapted for the screen by someone like Robert Zemeckis or Steven Spielberg or just about anyone else for that matter, we would have had to endure Tom Hanks in the lead role. Substance be damned...the Hollywood way. 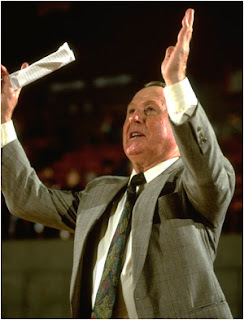 Which brings me to perhaps the biggest basketball upset since 1971. To be more precise, the date was January 5, 1971. The place was Martin, Tennessee. The winning shot just before the buzzer was made by a diminutive five foot seven inch guard named Klotz. The final score was 100-99. The victorious team broke what is surely the longest continuous, unbroken winning streak in history -- a staggering 2,499 games -- and they have not won since. The losers? None other than the Harlem Globetrotters. The winners? The Washington Generals, a team formed in 1952, by none other than Louis "Red" Klotz after Globtrotters' owner Abe Saperstein invited him to assemble a worthy adversary to accompany his team on their worldwide tours. 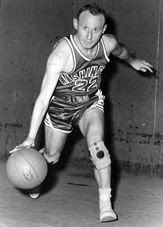 Over the ensuing decades, Klotz has served as owner, player and coach for this team named in honor of Dwight D. Eisenhower. Unlike Ike, however, Klotz was once labeled by SPORTS ILLUSTRATED "The General Whose Army Never Wins." Samuel Beckett once exhorted: "Fail better." With losses in over 100 countries and literally thousands of cities, towns and villages in North America, Louis "Red" Klotz continues to do exactly that.